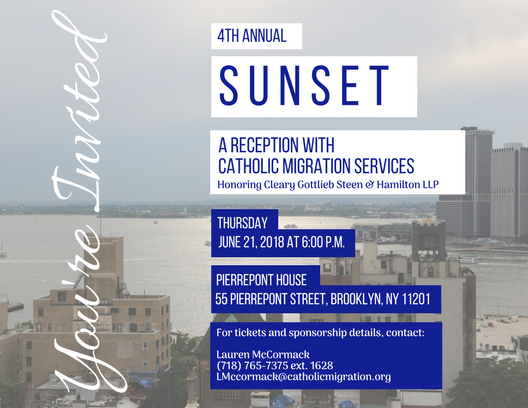 Our 4th Annual Sunset Reception is scheduled for Thursday, June 21, at the Pierrepont House in Brooklyn. Fill out the form below to reserve your ticket. Thursday, June 21, 2018 at 6:00 p.m.
Catholic Migration Services is deeply troubled and saddened by the Trump administration’s lack of commitment to immigrant youth. On September 5th 2017, Attorney General Jeff Sessions announced that the Trump administration was rescinding the Deferred Action for Childhood Arrivals program (DACA). DACA was a program put in place by President Obama to protect young people from deportation if they had been brought to the U.S. as children, and to enable them to lawfully work. An estimated 800,000 children and young adults across the country applied for, and were granted DACA status. These DACA recipients have been able to finish school and obtain jobs, contribute to our economy and communities, and live without the constant fear of deportation. For more information on the government’s termination of the DACA program and what it means to current DACA recipients, see our fact sheets in English and Spanish. For advice or assistance with DACA renewal applications, please call us at (718) 236-3000 (Brooklyn) or (347) 472-3500 (Queens). RSVP for the 2016 Shining Star Award Dinner! RSVP NOW for the 2016 Shining Star Award Dinner and celebrate the 45th Anniversary of Catholic Migration Services! Dinner 1 will be held Friday, October 14, 2016, and will honor Shining Stars from the following ministries: Czech/Slovak, Korean, Vietnamese, Ghanaian, Indonesian, Nigerian, Irish, Mexican, Colombian, West Indian, Dominican Republic, Puerto Rico, Ecuador and Cuban. The dinner will start at 6:30 and will be held at Gargiulo’s on Coney Island. Dinner 2 will be held Friday, October 21, 2016, and will honor Shining Stars from the following ministries: Polish, Ukranian, Russian, Croatian, Italian, Chinese, Indian Latin Rite, Lithuanian, Filipino, Pakistani, Brazilian, Guatemala, Haitian and African-American. The dinner will start at 6:30 and will be held at Gargiulo’s on Coney Island. Housing Attorney Kenny Minaya in NY Daily News! Kenny Minaya, housing attorney and coordinator of the CMS Immigrant Tenant Advocacy Program (ITAP), was recently mentioned in an article by the New York Daily News. Read more about the work we are doing in support of affordable housing for low-income immigrant tenants by following this link. Congratulations to Kenny and everyone supporting the incredible work of ITAP!